So I started reading about Bokashi again. And this time, one year on, many more people have it and have used it, and can attest to it. Since entering the blogging world, I tend to trust bloggers’ reviews of products. I can gauge how similar I am to them, or their process of thinking, by reading happily around their archives and deciding whether or not what they say can apply to me. I tend to search reviews on the internet and specifically on blogs. Initially, I avoided Bokashi Man because, although he’s a blog [sic], he was a seller of the Bokashi bran and plastic buckets. I thought he would be commercial. But eventually, I returned to his site and had a proper read. He is full of useful information, and is not just trying to sell his product. Indeed, he directed a person from New Zealand (we Aussies call them Kiwis, but I think perjoratively, so perhaps I should not) to another site from which they could purchase the product. He’s also a decent read…. P.S. There’s a neat pic on Oanh’s blog. Make this budget conscious compost bin for your deck or small outdoor space. [Full disclosure: I make and sell my own bokashi bucket system. I used “tinyurl” to keep the comment looking clean, but did not make them clickable in the original comment. It works. You do not have to invest in the commercial version. You can use the fermentation liquid on its own in your own bucket. contained in Biosa and similar products. The results you get from making your own lactic acid culture may differ greatly from what you have read here and elsewhere. On this site, you can get order information here. Comments welcome. Thanks to your reply I understand how to make the bokashi but I am still wondering whether or not it is possible to make EM without purchasing the original first. I had the same question, Ben. Biosa™, EM and all similar products can be compared to homebrew kits. You can buy all the equipment & ingredients for making wine or beer separately and experiment on your own with mixed, and sometimes toxic, results. But if you buy a kit and follow the instructions, you have a fair chance of making a perfect beverage all the time. Dr. Higa’s formulations, while not public domain, are made from naturally occurring elements. Lactic acid bacteria is also known to produce enzymes and natural antibiotics aiding effective digestion and has antibacterial properties, including control of salmonella and e. coli. To farmers, what are observed are the general health of the plants and animals, better nutrient assimilation, feed conversion and certain toxins eliminations. Here’s a simple method of collecting this type of microorganism. Lactic acid bacteria can be collected from the air. Pour rice wash (solution generated when you wash the rice with water) on a container like plastic pot with lid. Allow air gap at least 50-75% of the container. The key here is the air space. Cover the (not vacuum tight, allowing air still to move into the container) container with lid loosely. Put the container in a quiet area with no direct sunlight. Allow the rice was to ferment for at least 5-7 days. Lactic acid bacteria will gather in 5-7 days when temperature is 20-25 degrees C. Rice bran will be separated and float in the liquid, like a thin film, smelling sour. Strain and simply get the liquid. Put this liquid in a bigger container and pour ten parts milk. The original liquid has been infected with different type of microbes including lacto bacilli. And in order to get the pure lacto bacilli, saturation of milk will eliminate the other microorganisms and the pure lacto bacilli will be left. You may use skim or powdered milk, although fresh milk is best. In 5-7 days, carbohydrate, protein and fat will float leaving yellow liquid (serum), which contain the lactic acid bacteria. You can dispose the coagulated carbohydrate, protein and fat, add them to your compost pile or feed them to your animals. The pure lactic acid bacteria serum can be stored in the refrigerator or simply add equal amount of crude sugar (dilute with 1/3 water) or molasses. Do not use refined sugar as they are chemically bleached and may affect the lactic acid bacteria. The sugar or molasses will keep the lactic acid bacteria alive at room temperature. One to one ratio is suggested although sugar, regardless of quantity is meant simply, serving as food for the bacteria to keep them alive. Now, these lactic acid bacteria serum with sugar or molasses will be your pure culture. To use, you can dilute this pure culture with 20 parts water. Make sure water is not chemically treated with, like chlorine. Remember, we are dealing with live microorganisms and chlorine can kill them. This diluted form 1:20 ratio will be your basic lactic acid bacteria concoction. [this is the same recommended dilution ratio [.doc file] with Biosa/EM-1 etc. – Al] Two to four tablespoons added to water of one gallon can be used as your basic spray and can be added to water and feeds of animals. For bigger animals, the 2-4 tablespoons of this diluted lactic acid bacteria serum should be used without diluting it further with water. Lactic acid bacteria serum can be applied to plant leaves to fortify phyllosphere microbes, to soil and compost. Of course, it will help improve digestion and nutrient assimilation for animals and other applications mentioned before. For any kind of imbalance, be it in the soil or digestive system, lacto bacilli can be of help. One of the popular beneficial microorganism innoculants from Japan (EM) contains lactic acid bacteria as its major component, including photosynthetic bacteria, yeasts, actinomycetes and fermenting fungi. These are pure culture imported from Japan and can be subcultured through the use of sugar or molasses. These other microbes can be cultured in several ways by farmers themselves. There is a lot more. Read it all…. The good thing about a pre-packaged product is that you can make smaller batches successfully. 250ml of Biosa/EM with 250ml of molasses and 12L of water will make 40Kg/100lbs of bokashi. Another advantage is that it has a guaranteed shelf life – at most 1 year – which you can’t be certain of with the lactic acid you make on your own. This fertilizer has been tried by many Mexican and other Latin American Farmers. In each place the ingredientes vary, the result of trial and error and local knowledge. v 5 sacks of rice hulls or 4 bails of oat or barley straw. v 10 kg rice polishings, wheat bran or pig feed. v 1 lbs bread yeast. Gather to appropiate quantity of ingredients in an area that is protected from sun and rain, near a water source. Otherwise the prepared fertilizer should be covered with a large sheet of plastic or equivalent. A cement floor is good. 1. The ingredients are layered in the following order: rice hulls, soil,manure, charcoal, bran, lime. 2,- Se coloca por capas los ingredientes en el siguiente orden:cascarilla de arroz o paja, tierra, estiércol, carbón, pulidora de arroz o salvado o concentrado, cal. 3. – The molasses and yeast is mixed with (luke warm) water and then added to the water to be used. 4 – The water mix should be applied uniformly as the pile is made. NO FURTHER WATER SHOULD BE ADDED. The ‘fist test’ for the right amount of humidity: firmly squeeze a handful of bocachi. When released it should stay in a ball that falls apart easily. If it falls apart water is lacking, if water drips out, its too wet. Too much water is corrected by adding more dry matter. 5. We recommend turning the heap at least 2 or 3 times so that it is uniformly mixed. 6, Once mixed, it should be extended in a pile about 50cms high. 7. Cover with sacks or a plastic tarp. During the first three days the fermentation is intense and temperature can reach above 80º C, which should not be permitted. Try and keep temperatures below 50º C by turning the heap twice a day, morning and evening. As it heats up over the first three days it is a good idea to extend the heap more to a height of around 20 cms. After about 4 days, one turning per day is sufficient. 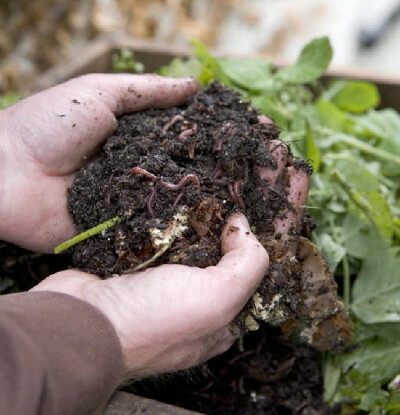 Between 12 and 15 days (depending on climate and specific ingredientes) the compost should be ready. It will be at ambient temperature and will be copletely dry, gray in color with a sandy consistency. It has a pleasant smell (like a Japanese nursery). phase. For corn, a motoroil can spread in a circle around each hill, just before flowering- etc.